Please note: more information on this conservancy will be added when it becomes available. The Lax Kwaxl/Dundas and Melville Islands area has a long history of use by First Nations. 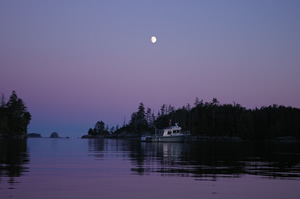 The conservancy is associated with Lax Kw’alaams and Metlakatla First Nations (collectively Coast Tsimshian). This conservancy comprises the islands of Zayas, Dundas, Baron, Dunira and Melville, as well as a large number of associated smaller islands. Lax Kwaxl/Dundas and Melville Islands Conservancy was identified for conservancy status during negotiations between the provincial government and First Nations governments following the North Coast Land and Resource Management Plan (LRMP). This conservancy was legally designated in Spring 2008. See News Release for more information. The Lax Kwaxl/Dundas and Melville Islands Conservancy is comprised of 23,482 hectares of upland and 9,600 hectares of foreshore, for a total of 33,082. It is located approximately 32 kilometres northwest of Prince Rupert. This area is an important First Nations traditional use area and has substantial cultural and social significance. The Lax Kwaxl/Dundas and Melville Islands Conservancy area has a long history of use by First Nations groups. Lax Kwaxl/Dundas and Melville Islands Conservancy is within the asserted traditional territories of the Coast Tsimshian First Nations. Coast Tsimshian values and uses of the area include harvesting for salmon (especially sockeye – musoo), herring (tskah), groundfish, clams, cockles, and other intertidal resources. The islands contain several campsites, some of historical importance, and many still in use by Coast Tsimshian members for seasonal harvesting of marine and land resources.